Our Funarena! : Assam Violence: And Then Mumbai, Pune, Bangalore…India! Assam Violence: And Then Mumbai, Pune, Bangalore…India! Some fundamentalists are playing a sinister game of communal politics taking advantage of the Assam violence that erupted in July, 2012. These forces are spreading rumors through mobile short text or multimedia messages and are trying to create panic—place by place and community by community. First point to note is that Assam has had no history of communalism ever as we have said earlier too. What happened there was due to increasing economic pressures created by continuing illegal immigration over the decades and the erupting ethnic violence involved poor people of various communities who just want to survive. These threatened people cannot afford to indulge in religious luxuries or wars. 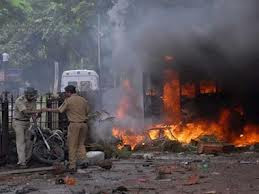 The Assam violence had its first case of blatant misuse in Mumbai in the afternoon of August 11, 2012. People of a community of Mumbai had a demonstration to protest against the ‘killings’ of their people in Assam which was untrue conceptually, because the ethnic violence was not a ‘killing’ spree, it was a terrible and almost inevitable human tragedy. Anyway, the protest march was planned peacefully and in a democracy it had to be permitted. But some evil forces penetrated the march and created mayhem in the most prominent locality of the city. Nobody expected such a chaotic situation from a peaceful demonstration and it took the police and the media who were the main targets by total surprise. For one hour the unbelievable rioting, burning, loot and anarchy prevailed leading to deaths to two people and injuries to many including policemen and journalists and media vans. The fundamentalist forces had their first strike. One led to the other. After the Mumbai violence many people admitted receiving inflammatory and instigating messages regarding the planned protest. The messages then spread to Pune and the students of the North East region where Assam is situated were reportedly harassed and threatened. Then the evil designs invaded Bangalore—the IT hub of India. North Eastern students started fleeing their hostels in panic and in thousands taking the next available trains or flights. The fundamentalist forces are trying to create a communal divide all over India by targeting the North Eastern students in the garb of ‘revenge’. The government of India and the concerned states have been taking steps to reassure the safety of all people from Assam and the North East living anywhere in India. But the rumor mongers and the divisive forces must be stopped before they target new areas. All of the evil forces must be punished immediately and involved politicians in this sinister game must be identified. Stop the Assam Tragedy NOW to SAVE India tomorrow.